All my Thanksgiving photos came out blurry. Vermont is pretty dark come November, with the sun setting around 4:30 or so and the light fading quickly. In a way though, I feel like this picture sort of captures the essence of the holiday and this year's celebration for me - warm and fuzzy, pretty without being fussy, and just incredibly comfortable. Childhood friends came to visit, and it was amazing to me how smoothly we all can rejoin each others lives - the 4 of us cooked together so unawkwardly in our little kitchen and then we hung out the rest of the time and chatted and watched movies. It was utterly relaxing, and absolutely heartwarming. I am so thankful for these friends (and super excited that they are living on the east coast now! though C. and I are actually going to be spending some time in the southwest over the winter so so much for that). I was gifted a fabulous art clock at one of our arts festivals in the fall, and it turns out to have only hour and second hands. 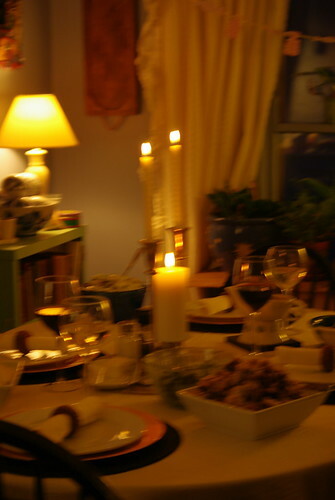 So one fun part of Thanksgiving weekend was when someone queried the hour, the response would be "oh, somewhere between 5 and 6..." Just a little more comfortable blurriness.